the diary of mrs x: The Dread. I know I know... I'm supposed to be talking about Bre's birthday party and all but really? How much do you need to know? Doesn't this kind of tell you it was over the top? 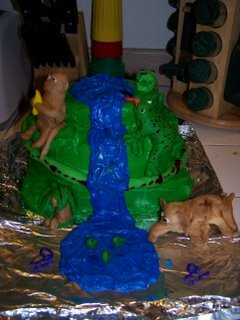 Kid's throwing sticky frogs at my wall (they were totally supposed to, I just failed to anticipate the amount of goo that could be left on the wall afterwards), cake, presents, games, crazy. Whatever. It's over. She's 9. She's killing me with her Hannah Montana. No, the dread I'm thinking of it what's coming on Thursday. See, Thanksgiving and I do not get along. This Thanksgiving will mark 7 years since my mother died. 7 years since that Thanksgiving gravy train ended. Actually, since she died in the morning, we didn't even have Thanksgiving that year. But let's not get back into that mire again OK? Let's talk about Thanksgiving since then. Because they have all been spent here. With my in-laws. Last year we celebrated by discussing Neuticals and how they may or may not benefit one of my BIL's who was not there for this burn. We also celebrated by my MIL calling me sloppy seconds and she doesn't understand why anyone would want sloppy seconds. Cheers! This is all pretty typical for the holidays now. Except that this year I won't have to cook it all myself. (yay!). I wonder if I'll have to clean it all up by myself though...... hmmm. No, this year will be extra special because my BIL and his wife (they hate us. the feeling is mutual) have decided to come over too. Too fully understand just how wonderful this will be, allow me to elaborate. BIL and his wife hate each other. They have 2 kids and just bought a new house to 'fix' their marriage. They will go out of their way to not touch each other. There will be much yelling (mostly she at him) and much glaring (them at everyone and possibly Joe at them). And my MIL? She loves the wife. She loves her because Wife is Catholic and therefore perfect and everything I am not. Wife is not sloppy seconds. Wife had a good Catholic wedding (we went to Vegas which means I am the devil). Wife can do no wrong even when she is verbally abusing MIL's son in front of his family. Wife is a miserable person. I don't think she knows how to be happy. Nothing is ever right enough for her. She hates me, has since the first time we met. I do not regret the fact that we live so far apart as our visits are rare and brief. I know she feels the same. But to make things just that much better, Joe is, and has been, furious with this brother for some time. He didn't want him here for Thanksgiving but I could not think of one plausible reason that they couldn't come given that the rest of his family will be here. Which means that in between the cooking and tending to the kids and fielding insults on my inadequacy from my MIL and avoiding Wife, I will be playing referee/interceptor to my husband and his brother. I have this knot, see? Right there. Yes, that's it. There in between my shoulder blades, which yes thank you they are very sore. What's that? Tension? Stress? Me? Why no, I mean.... no. Couldn't be! We do this all the time. See? I'm smiling. Yes, I know my MIL is calling me names but really, it's alright. She kids! Really! OK, so maybe I don't need her to like me. Yes. That's it exactly. I don't. Need. Can I pretty please come to your house for Thanksgiving this year? You need an ipod/mp3 to wear (volume on HIGH) and lots of wine to drink. Skipping the wine and going straight for the little bottle of whiskey in the side door of the fridge that I forgot about.